Our technicians are properly equipped to tackle any size crane or hoist repair. CraneWerks trained crane and hoist technicians are on call and ready to serve you 24 hours/day, 365 days/year. Whether it’s a ¼ ton hoist or a 200 ton crane our technicians have the experience and perseverance to get the job done. Our technicians will promptly diagnose and repair the problem. 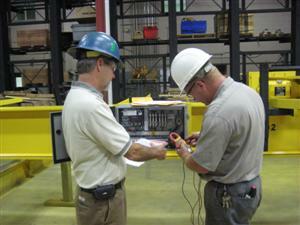 When hoist/crane parts are needed our technicians will work diligently to secure the necessary parts. If parts are not immediately available our team will work together to develop a temporary solution to keep your operations running. 24 hour service is provided through a qualified team of crane technicians, mechanics, electricians, and riggers. Our technicians pride themselves on documenting their actions as it relates to the service work that they have performed and detailing additional work that might be required. Highly productive maintenance contracts can be arranged through the CraneWerks Service Center. In almost all situations, maintenance contracts cost less than hiring additional personnel to maintain the equipment. Crane and hoist inspection, routine service and non emergency repairs can be scheduled for off peek production times without affecting daily operations. Preventative and predicative maintenance programs can be custom tailored to your individual needs. 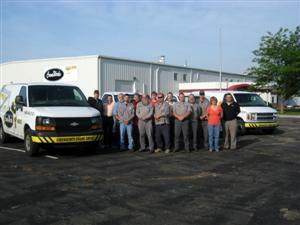 Our team will develop a program to work in conjunction with your operations. Allow us to focus on your overhead material handling needs so you can focus on daily production items. 24/7 emergency service, additional technicians, backup personnel, parts and equipment specialists, fabrication and engineering staff, structural and design teams. Equipped with the latest personal protection equipment and personal safety training, services provided through the CraneWerks team of professionals are safe and trouble free.